I rarely write about food on this blog – that’s not due to a lack of interest, but rather just a matter of focus – this is a wine blog, after all. But following a recent trip to San Daniele di Friuli, to sample wines and enjoy the famed local prosciutto, I felt compelled to write about the San Daniele PDO (Protected Designation of Origin – essentially the same concept as appelation contrôlée in wine). As you admire the deep red hue of a leg of Prosciutto di San Daniele sitting on its carving clamp, you may imagine the artisanal process by which it was made – some pigs running around in the field, the ham hung from the ceiling in the farmer’s cellar as it slowly matures. However this is pure fantasy for the vast majority of Prosciutto di San Daniele, which is produced on an industrial scale, using meat from factory farmed pigs. This is not to doubt the consistent quality of the product – the PDO regulations are fanatic in their detail, designating everything from the breed of the pigs (Usually the Landrace Danish cross), to their age and weight when killed (9 months, around 160Kg), and the ingredients that can be used in the cure (just salt, basically – nitrates are forbidden). But there is one area where the PDO literature is strangely silent. That is the manner of pig rearing. 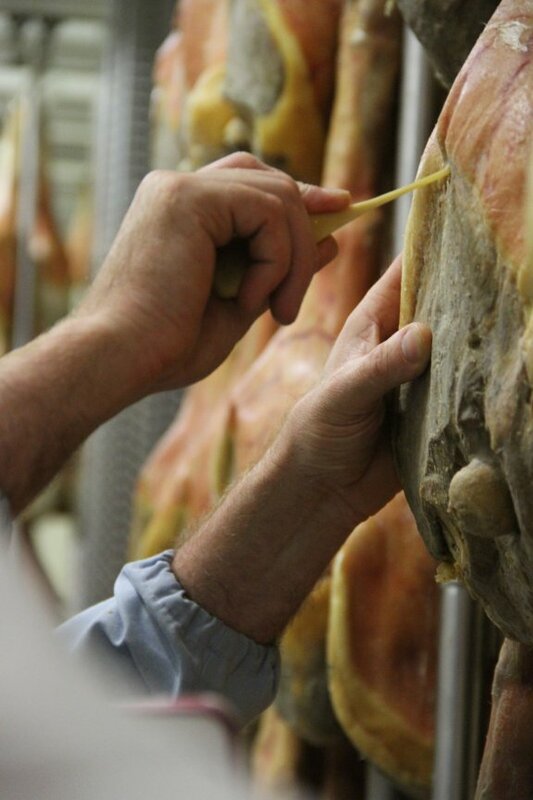 Perhaps many of us believe when we buy a premium product like prosciutto that the raw materials are also produced to the highest possible quality standard, but this is largely not the case. Surely, you may ask, outdoor reared or so called “free range” animals would be used to create the most flavoursome product? Well actually no – most prosciutto producers, and indeed the consorzio, will meekly protest that it is not possible to rear the necessary quantity of pigs with any access to the outdoors. Does this matter? The answer may depend on your own moral compass, or feelings about factory farming. My view is that animals are a vital part of sustainable farming, but also deserving of the utmost respect. For me, that means breeding and raising them in humane conditions that allow natural behaviour to be exhibited – and being kept indoors for your whole life does not fit that bill for a pig. Anyone who has ever watched pigs snuffling around to find grubs, acorns, or other goodies nestling in the grass will know what I mean. It also means allowing slow growing, not artificially boosted by chemically-enriched diets, steroids or routine antibiotics. Furthermore, I do not buy the argument given by producers that they have no choice but to use factory farming methods and indoor rearing. It is largely a matter of price points and customer demand. Why else have giants like Macdonalds (in the UK) and Mr Kipling cakes switched to using only free-range eggs, across their whole range? No, here’s where the real problem lies – because a “value added” product like Prosciutto is conveniently divorced from its origins, it is just too easy to maintain the bucolic image in the customer’s mind – and thus to avoid any need to explore a more humane way to rear the meat. I must however commend Principe, San Daniele’s largest producer of Prosciutto. They do go a little further than the PDO regulations, in stating that they never use antibiotics, and that they “recently started a new farm-to-field program to ensure world-class animal welfare standards by building (their) own breeding farm, Fattorie del Principe.” They continue: “The pigs are raised in a natural environment in pens three times larger than required by the European Union’s 2013 minimum standard. The space is designed to stop the need for tail docking and teeth grinding or clipping.“. So, Principe don’t cut off the pig’s tails or remove their teeth. 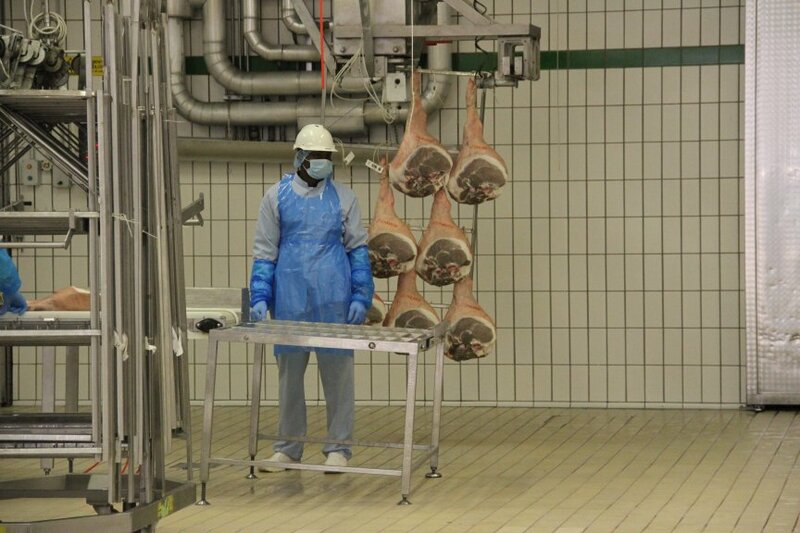 I wonder how many less lucky prosciutto pigs are treated in this barbaric way – most, I suspect. I note that Principe does not state what proportion of their production is sourced from their own farm. Our group of journalists and bloggers visited the Principe factory in San Daniele, and although the industrial scale of production is not to my taste, there’s no doubt that they run an exemplary operation in terms of hygiene and efficiency. 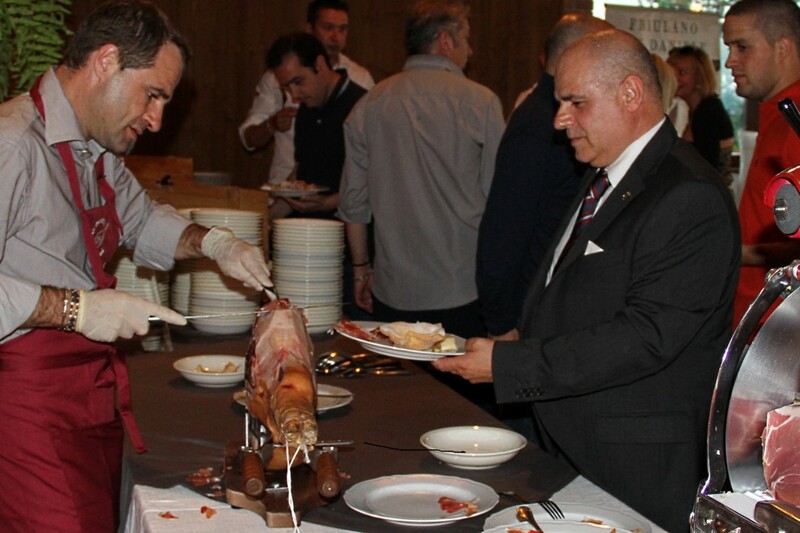 One of Principe’s quality assurance staff mentioned that they have a single customer who stipulates organically reared pork – I asked if they could taste the difference in the final product. The slightly sheepish response was yes – it did taste a bit better. This leads me to wonder why Principe or other enterprising producers don’t create a premium range, with slow-grown outdoor reared pork. There is no question that the flavours would be more complex and satisfying, and a higher price could easily be justified. That brings me to my next gripe. If we compare a PDO like Prosciutto di San Daniele to its equivalent in the wine world, the problem becomes obvious. What if AOC Puligny-Montrachet or Pauillac could be churned out in 5L wine boxes, and made with oak chips, in addition to the high quality versions? The poor consumer would struggle to understand what the point of the AOC was. 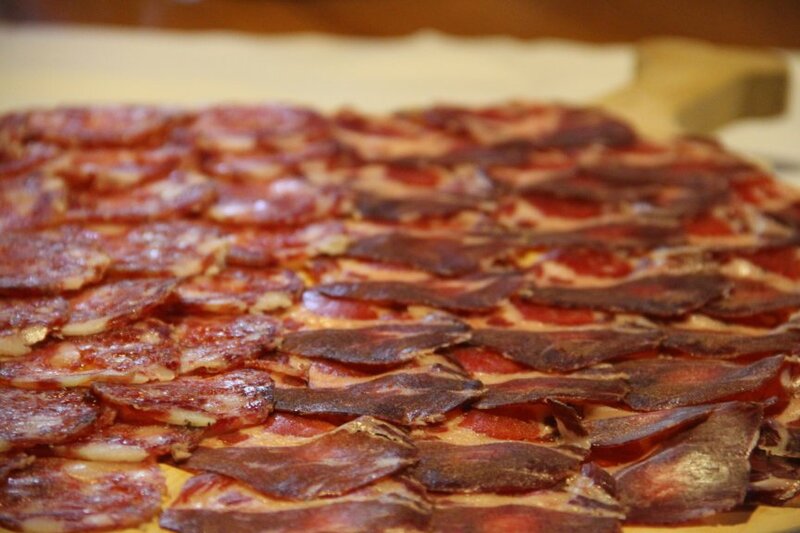 Yet, with PDOs like Prosciutto di San Daniele, there is nothing on the label to signal to the end customer whether they are consuming the most economically manufactured factory product, or a truly artisanal “slow food” version. I’m sure that self respecting Italian gourmets have their favourite producers, but the export customer may not have this insider knowledge. The danger is that the PDO and the very tradition that it seeks to protect could become compromised. Essentially, the quality level has to drop when products are being produced on a massive industrial scale. Most Prosciutto di San Daniele that I have tasted is faithful to the PDO concept – the texture, age and colour all tick the right boxes. But the flavour can tend towards the bland, which is probably not surprising when you consider the raw materials. 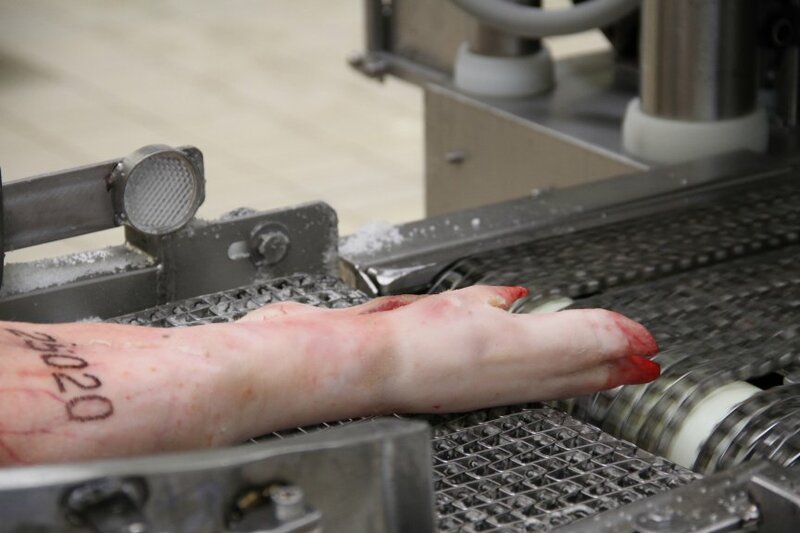 Factory farmed pork can never recreate the taste of a traditionally reared animal, even with 13 months’ aging. The day after visiting Principe, we were lucky to gorge on some homemade coppa and salami at Magnas winery and Agriturismo, in Isonzo del Friuli. 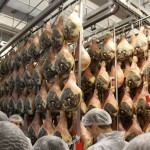 The comparison with “industrial” prosciutto was marked. The intensity of colour and flavour was on a different scale, the whole experience sublime. A bittersweet reminder of how far prosciutto production has come from its peasant or “artisan” roots. Disclosure: I was the guest of Aria di Festa / Friulano and Friends, who arranged the visit to Principe and various wineries. Thanks for highlighting this. I think that drawing the comparisons between the standards required for PDO and AOC is an excellent one to draw. I have previously fallen into the trap of believing that PDO products are also high welfare, but will be looking at this in more detail from now on. I also think that perhaps mailing a link to this post to the body that awards the PDO and asking them to answer the points that you raise would be a great way of beginning a wider conversation on the issue. I might send this to the Corsorzio di San Daniele. I did talk to them about it, both in London and in Friuli, but lets just say that attitudes towards animal welfare are quite different in the UK and Italy. People maybe care about animal welfare in the UK for the wrong reasons – ie: they’ve become squeamish, after watching so many TV documentaries about factory farming, but it does seem higher on the agenda here. I don’t want to just argue this on the welfare ticket though. I care just as much about the flavour of the end product, and it is plainly superior when you have “happy” naturally reared animals as your raw material. You are quite correct that different methods of animal rearing don’t automatically result in a better end product. However much of the thrust of my original post is that the consumer should be able to choose what kind of product they are buying. If they are happy with a product made on a huge, industrial scale using factory farmed meat, that’s fine, but if they wish to purchase an artisanally made small-production type of Prosciutto, it should be their choice. It is also up to the consumer to decide which product they prefer and whether there is a quality difference. 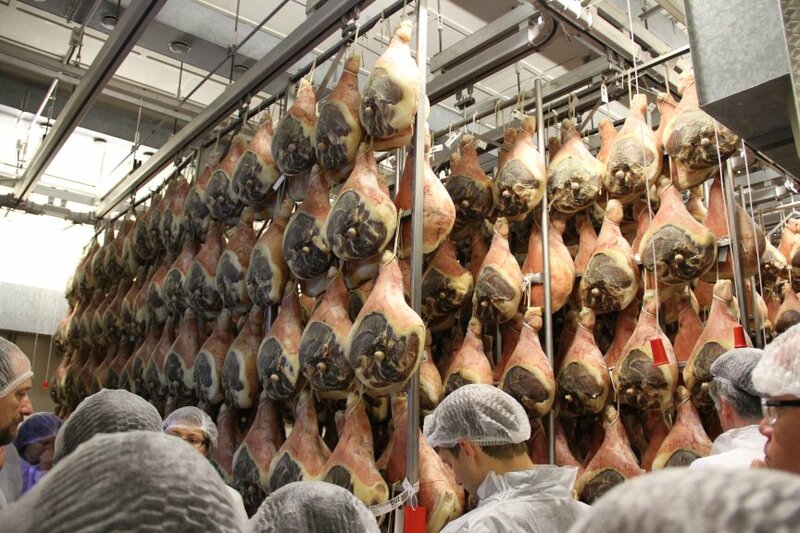 The challenge is that with the Prosciutto DOPs there is NO clue on the labelling, and no information provided to the customer that would allow them to make this choice. That is what I believe is wrong here. I would agree with that. Choice is good. Jamon Iberico all the way! Apparently even the “Iberico” term is open to abuse these days. The DO should certainly deliver outstanding quality, and animal welfare, but there seem to be more and more producers/restaurants/importers playing fast and loose with the term to describe products which don’t fulfil the strict DO criteria. What do you mean Ryan, when you say “discussion of balance between industrial and artisan” ? There is a place for both. Not all industrial farming is evil. This is odd, my post on Facebook just now has some links to a podcast that is interesting to listen too. It talks more of the middle ground. Not directly related to this debate, but it does show that more people talk about food from personal emotions that real numbers and impact. that is undoubtedly an issue. But the bigger issue in the UK is that people have become totally divorced from food production, to the point that the wool can be pulled over their eyes too easily. I’m all for choice, so long as it is transparent and available. I’ve seen Jamon Iberico with additives and nitrates? Shame. I am crestfallen by this article – I feel so naive Ive been using prosciutto instead of bacon as I thought it was a more ethically farmed pork and definitely tasted better than Australian bacon. I feel quite sickened now! Thank you for posting this. I wrote tot San Daniele asking about whether the pigs were kept in pens or were free range a while back and this is not what they told me in reply. Unfortunately there are no guarantees in terms of “ethical”. The best advice is to buy local, and cultivate a relationship with someone as close to the production chain as possible. Lilapud – you are not alone. Many people assume that these products are small production/artisanal, because that’s how they’re presented and packaged. Don’t feel sickened though. There is a lot worse than San Daniele ham, in terms of animal welfare. Most Danish bacon for example! This is another fallout of the industrial age and hyper consumerism. Hopefully, people will start taking a bigger interest in where their food is coming from and choosing to spend their money accordingly. Yes, it would be certainly be better to eat less of a higher quality product, But that’s a very difficult message to get across to consumers who have been “enjoying” cheap, factory farmed food for a few decades . . . Thanks very much for highlighting this issue. In studying the PDO requirement document I found there to be no mention of ethical or humane animal rearing. I am now on a mission to find ethically raised charcuterie. The closest so far is the Jamón Ibérico de Bellota product with the pigs allowed to road the countryside eating acorns which improves the flavor. If anyone has other suggestions I would appreciate this. I know this post is from awhile ago, but I think it’s an important topic. I had not heard about this with San Danielle, but DOP Prosciutto di Parma is facing similar issues, where the bigs don’t need to originally come from the area. They can be born elsewhere in Europe, so long as they finish their last few months locally.